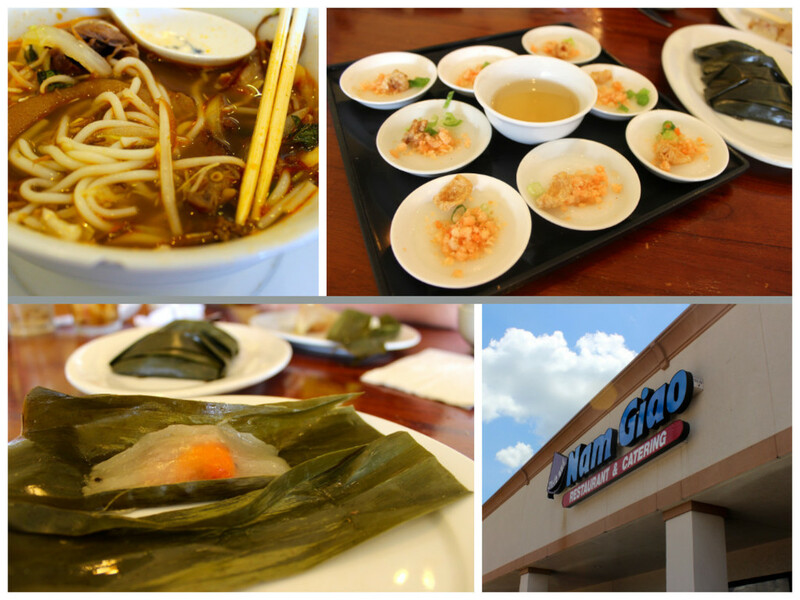 Clockwise from top left: bun bo Hue, banh beo, Nam Giao's exterior, banh bot loc la. "What's going on?" my dining partner asked, regarding the tubs of yogurt that had just been delivered our table with a confused look on his face. "For dessert!" our waitress smiled as she dropped off additional tubs at each table in Nam Giao, a Vietnamese restaurant in Chinatown specializing in dishes from Hue province in Central Vietnam. "Vietnamese yogurt?" my friend asked, quizzically. "Well...okay." "Just try it," I suggested. I'd already popped the top off my plastic tub and dug in with a spoon. "It's really good." Creamy, sugary, and with a pop of lemon, Vietnamese yogurt—or da ua—isn't your typical tub of Yoplait. Like Vietnamese coffee, cà phê sua da, it's made with sweetened condensed milk. The result is a much richer, sweeter yogurt than one would expect—at a Vietnamese restaurant or anywhere else, for that matter. Da ua is pronounced "yah u-ah" and is a transliteration of the French word for yogurt, yaourt. Vietnamese yogurt's origins are Gallic just like banh mi (French baguettes), cà phê (coffee), and pho (pot-au-feu, or boiled beef). 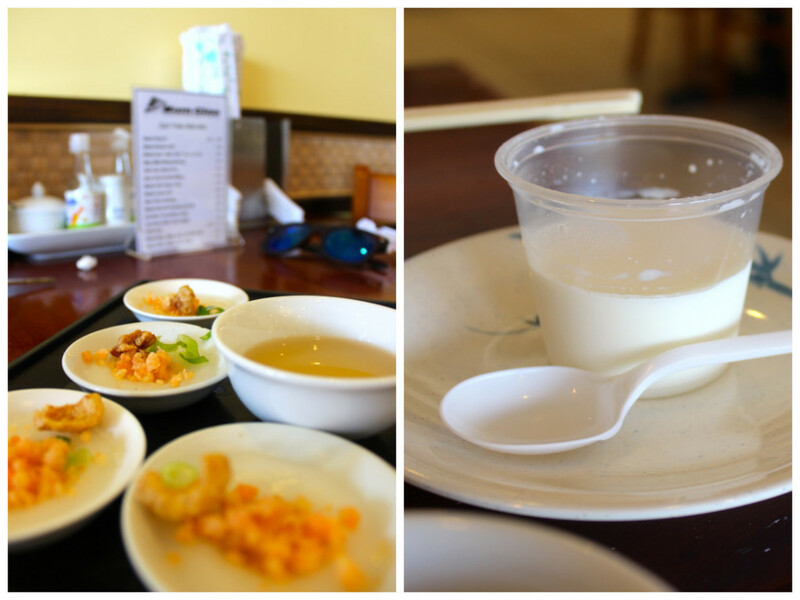 When you think about it that way, yogurt at a Vietnamese restaurant doesn't seem so odd. Banh beo and homemade yogurt. The refreshing dessert was a soothing finish after all the funky dishes that come before it. The bun thit nuong with homemade vermicelli noodles was the best I've had in a very long time thanks to those slippery-soft, al dente noodles and tender, well-seasoned chargrilled pork. But the bun bo Hue presented a challenge. 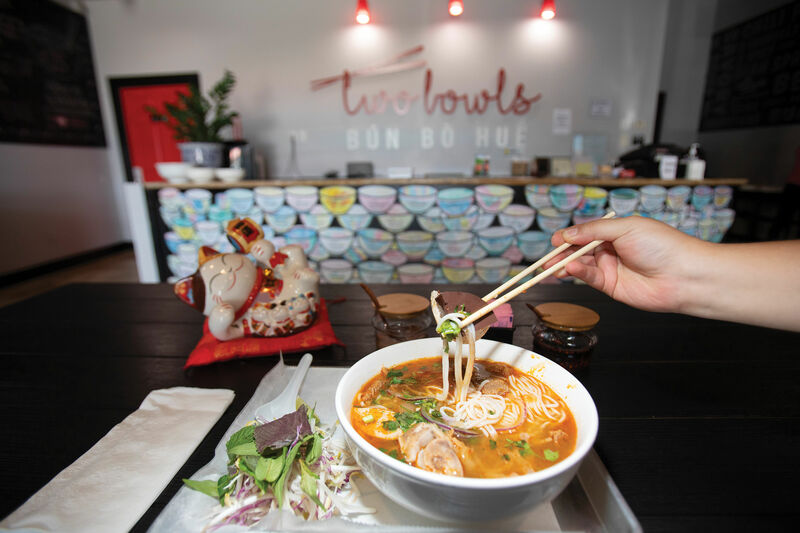 Those who favor the beef and pork flavor of bun bo Hue are chasing its signature balance of sour, spicy, sweet, and salty flavors. Much of the latter flavor comes from the mam ruoc, or fermented shrimp paste, which lends a briny funk to whatever it's mixed with. At Nam Giao, most of that flavor is absent—I don't think the bun bo Hue has any mam ruoc in it to begin with—and you're left instead with just a spicy stew (which is lacking in lemongrass, to boot). 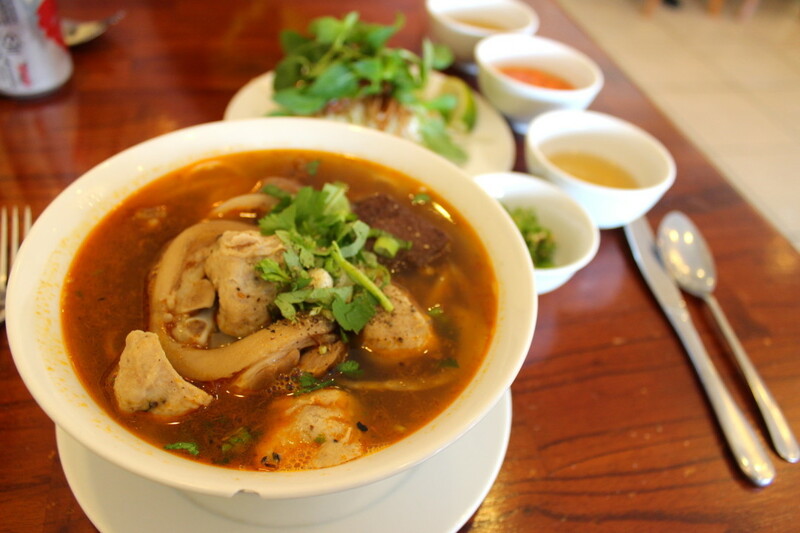 As I understand it, some people—yes, even some Vietnamese—prefer their bun bo Hue this way. I liked mine alright, but vastly preferred the noodles as they were presented in my friend's bun thit nuong. And I liked the steamed cakes even more. For appetizers, we had the thin pancakes topped with crispy dried shrimp called banh beo, and the pork and shrimp "tamales" steamed in banana leaves called banh bot loc la. 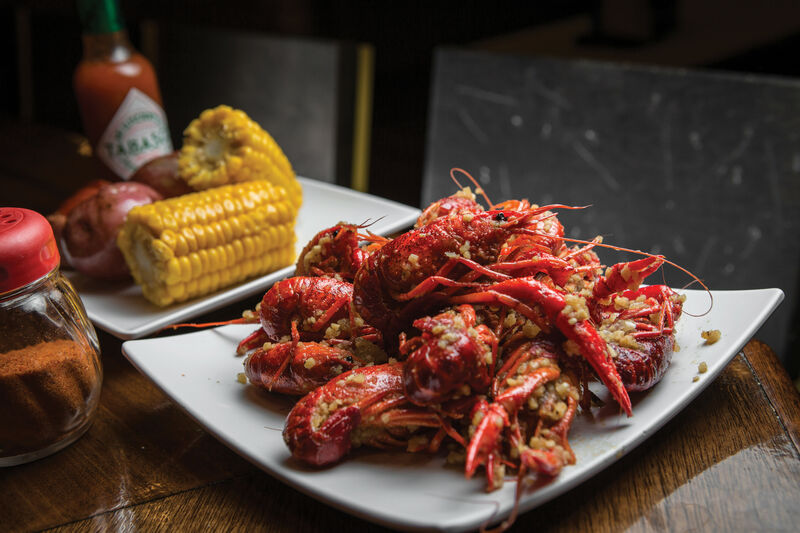 These dishes can be a little bland, both are more about texture than anything else. The "masa" in those "Vietnamese tamales" called banh bot loc la is pure tapioca flour. It cooks up dense and chewy and has to be loosened from its banana leaf sheath with a spoon before eating. I like to chase mine with a little fish sauce to add a salty kick and to ease the sticky dumpling through the chewing process. For pure gustatory pleasure, the banh beo are the best. The blend of rice and tapioca flour means the glutinous pancake isn't as sticky as the banh bot loc la, but a little work is still required to jimmy the crepes out of their individual bowls. The crispy dried shrimp topping is complemented by bright zings of green onion, and crunchy dried pork skin—essentially Vietnamese chicharrones. Work the banh beo out of its small bowl, top it with a spoonful of fish sauce, and slurp the whole thing down. 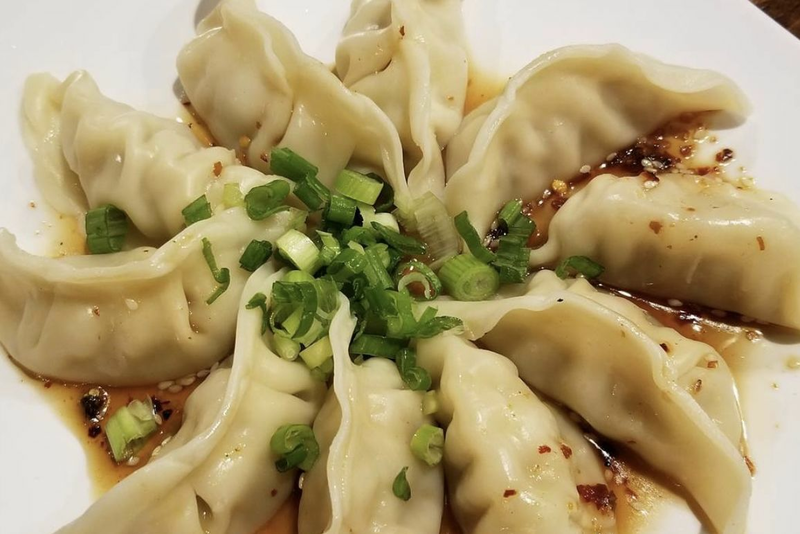 Savor the playful textures of crunchy pork and shrimp against the jiggly, chewy dumpling and repeat until your allotment is gone. The banh beo come eight to a tray, which is ideal for splitting with a group. Lucky me—my dining partner filled up on bun thit nuong, so I got all eight to myself.